Along with some really impressive looking features and statistics, 'Made in Japan' is proudly stamped onto the rear face of the focus wheel. 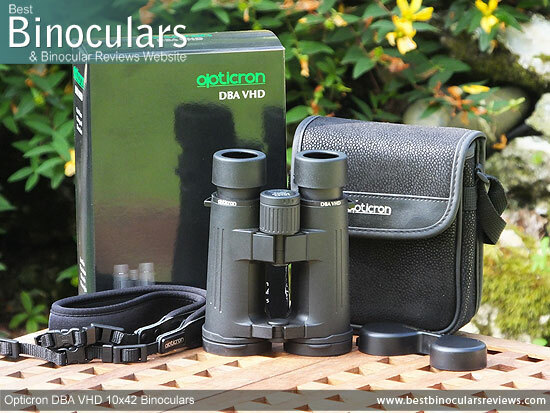 This leaves you in no doubt as to not only the potential of these Opticron DBA VHD 10x42 binoculars, but the lengths that the manufacturers have gone to ensure the highest quality production techniques and materials have been used. Produced in both 8x42 and 10x42 arrangements, both models use roof prisms and thus have their objective lenses directly in-line with their eyepieces. 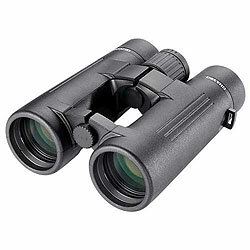 The Opticron DBA VHD binoculars are also characterized by their open bridge body design with two hinges connecting the barrels together and a large open area separating them. Neck straps are great when simply walking about, but when climbing over rocks or through thick undergrowth, I don't like like to have my bins hanging around my neck via the strap as they can still swing about and get damaged. So this is when being able to securely hold them (or use a harness) becomes important. The other potential upside is that the less material used can make for a more lightweight body, but in reality, the two hinges that have to be robust usually more than make up for this. As is the case with almost all modern optics, the vast majority of the instruments exterior is covered in a rubber armour. Colored black, it is relatively hard and smooth on the Opticron DBA VHD 10x42 binoculars, which has the advantage of being longer lasting and less inclined to deteriorate than softer rubbers. On the other hand it provides less grip and defence against collisions. The bridges are left exposed and here we can easily see that they are not plastic, but manufactured from magnesium. The hinges on my sample felt very strong and thus the two lenses are far less likely to become unaligned. Whilst not advertised, I got confirmation from Opticron that the main chassis is made from both magnesium and polycarbonate components. Due to the fact that most of it is hidden under the rubber armour, I cannot be sure as to exactly which parts or made from which material, but to me it looks like most of the chassis and the bridges is Magnesium, and only a few small parts fashioned from plastic. 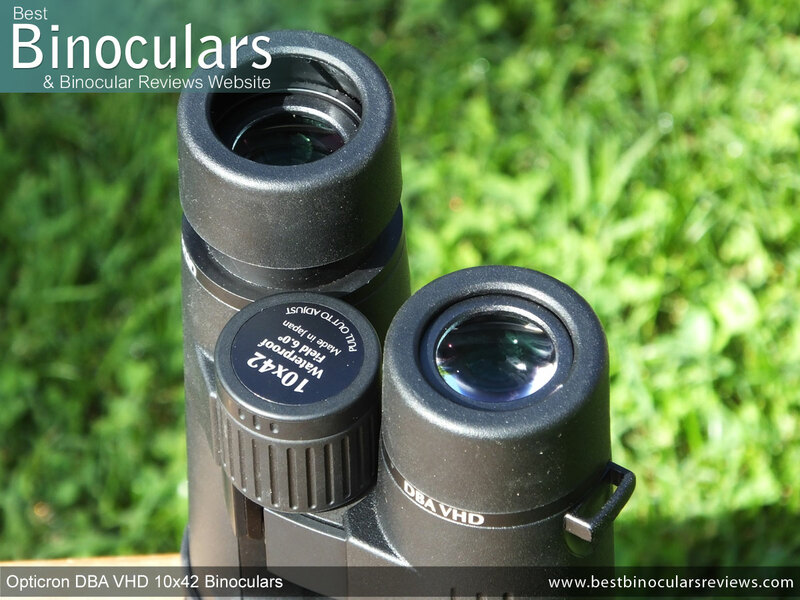 With a pair of optics in this class it is no surprise to reveal that the body on the Opticron DBA VHD 10x42 Binoculars is completely sealed making them both water and air-tight. 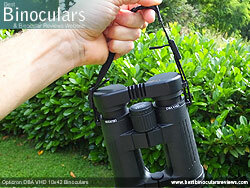 Opticron also quantify this by stating that they are waterproof tested to a depth of 16ft (approx 5m). I feel that it is always important to stress that fully sealed optics are also protected from dust and thus it is an important characteristic in dry areas as well. 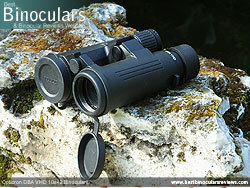 Opticron use Nitrogen gas for the Fog Proofing in these optics. 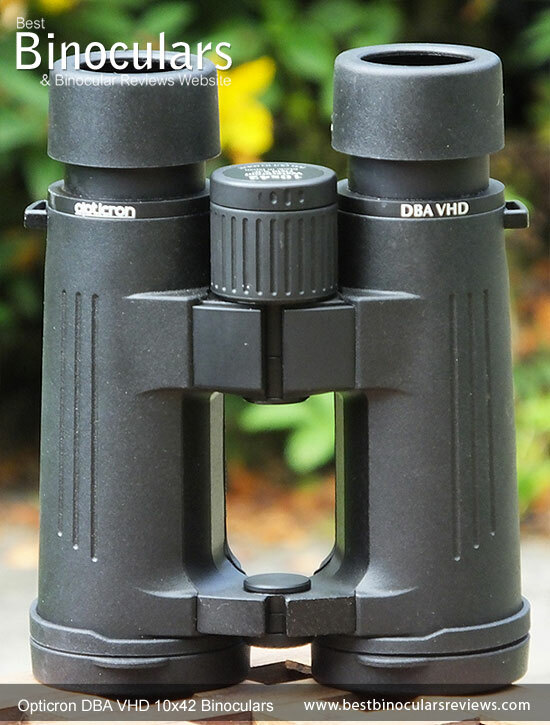 As I have already mentioned, the central bridges and the actual hinges of the Opticron DBA VHD binoculars are metal and feel very robust. These points are really important as it ensures the two barrels remain perfectly aligned. By opening and closing them you can adjust the distance in between the eyecups so that they line up with your eyes (IPD). This adjustment was perfectly smooth on my sample, but with enough resistance to ensure they remain at your desired IPD setting. 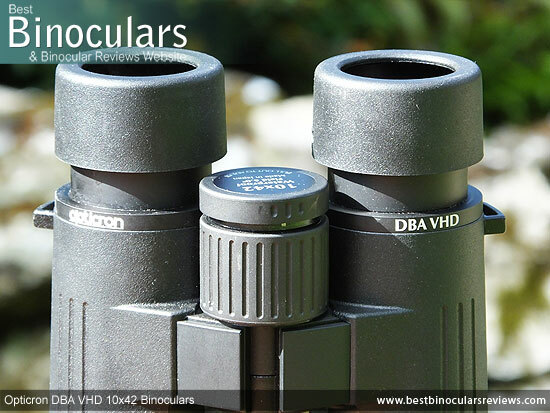 The Opticron DBA 10x42 VHD has a Inter-Pupillary range of 5.6cm to 7.4cm, which is good for this class of bin: compare with others here. Whilst the majority of modern bins are 'tripod adaptable' in that they make it very easy to fix them to a tripod by using a tripod adapter that screws into the front of the bin, not all are, especially those with a double hinge body design. Thankfully this is not the case with these Opticron's and it was simple enough for me to unscrew the dust cap on the hinge and then screw in the adapter. Worth taking note of if you plan on fixing your bin to a tripod is the fact that there is also plenty of room in between the two objective lenses on this Opticron binocular for the adapter to easily fit. This is not always the case. With a diameter of 41mm, the rubber padding is adequate so as to make them reasonably comfortable. Under the rubber, the housing for the eyepiece and the cups themselves looks to me to be made from metal and they feel very robust, which is important as this is the part of a bin that most often gets damaged if they are dropped. 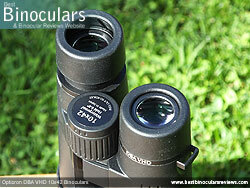 Opticron have only added a single fixed stop at the midway point which is not as many as some. However the helicoidal mechanism works as you would hope in that it is perfectly smooth without any tight or loose sections and it does not turn too easily and thus it makes it straightforward to position them exactly at the point you need them and they will remain at that point. Enabling you to calibrate your bins so that they match your particular eyesight, the vast majority of diopter adjusters I see are placed near one of the eyepieces (usually the right) and usually not lockable and I would describe as being very basic. 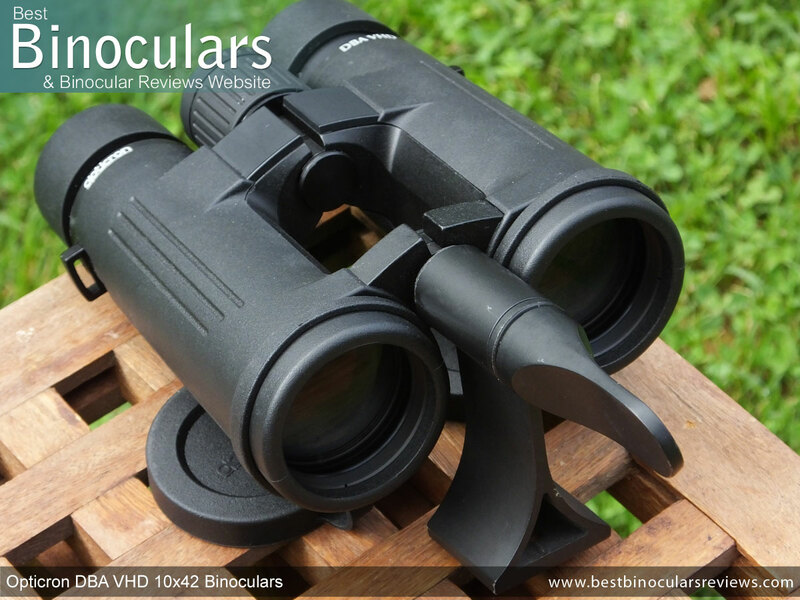 However as with some of the very best binoculars out there like the Swarovski SLC 10x42, these Opticron DBA VHD binoculars have incorporated the diopter into the focus wheel. But rather than turning the whole wheel as you do with the Swarovski, just the rear of it is used to make the adjustments. I really like this system as not only is it more discrete and/or cleaner looking than those positioned near the eyepieces, but it is lockable and I find that it is more intuitive and a little less confusing to use than the 'Swarovski' method. To engage the gearing on the diopter you pull back the rear section of the focus wheel and simply turn it as you would the focus wheel, but rather than turning the whole wheel, only the top part is used for the diopter. 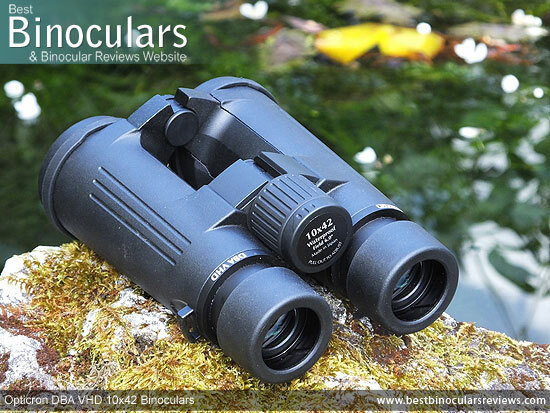 Then once you have set up the binocular to match your eyesight in the usual way, you simply lock your setting by clicking the top section of the wheel back in place. Excellent. 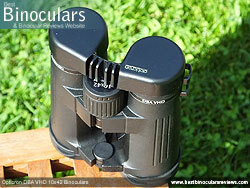 The focus wheel on the Opticron DBA VHD 10x42 Binocular is placed on the pivot point on the rear hinge. This prominent position along with it's large size (31mm diameter) make it easily accessible or those with either small or large hands. Add to this the grooved rubber track and smooth turning action and you have a wheel that is very easy to adjust accurately. One point worth mentioning however is because the rear face of the wheel remains static, you have to be a little more careful where to place your fingers to make any adjustments. This is a very minor point and you very quickly get used to this slight difference. However I did find that whilst testing them by wearing my thick winter gloves, I had to be a little more careful than usual so as to make sure the wider gloved finger did not land on this immovable back section. But as I said this is only a very minor detail and nothing to get to overly concerned with. The gearing of the focus mechanism is such that it takes two complete turns of the wheel (730° of rotation) to modify the focus from maximum to minimum distances. This is quite low gear, which makes it that tiny fraction more straightforward to make precise changes, but on the flip side, takes a little more turning to make large focus adjustments. 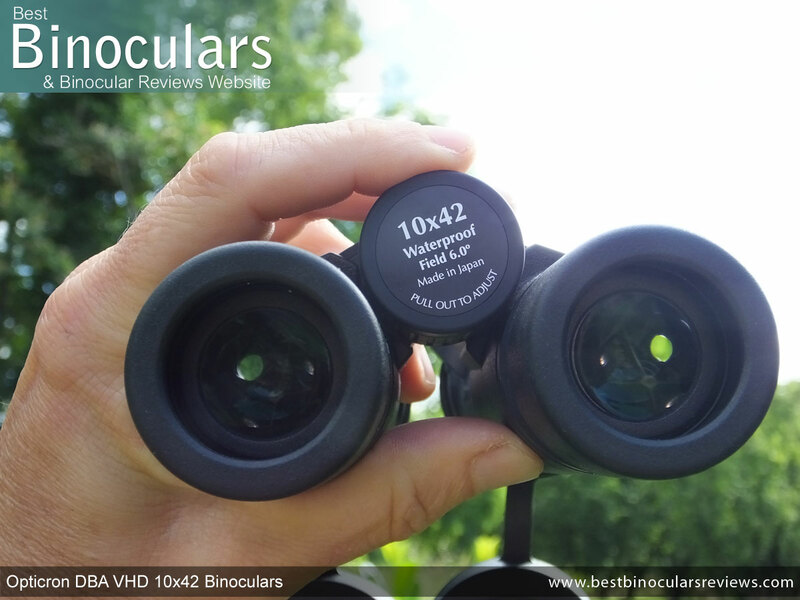 The Opticron 10x42 DBA VHD binoculars do look and feel a little smaller than your average 42mm bin and this is indeed bourne out by the official dimensions, which as you can see above compares favourably with a selection of others that I have reviewed in this class. Those are the official figures above, I checked this and measured the length of my sample to be 14.3cm (with lens covers removed & the eyecups twisted in). 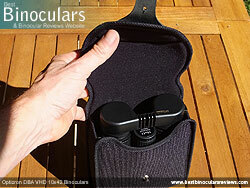 This increases to 15.3cm when you twist the eyecups open and then to 15.7cm when you add the lens covers. The height (depth) of the instrument varies depending on if you have the hinge open or closed and if you have the lens covers attached to it as the fold in the rubber makes quite a big difference. So with the hinge open, their height is 6.3cm with lens covers on and 5cm with them off. With the hinge closed it is about 8cm with the lens covers and 6.5cm without. Like almost all manufacturers, Opticron do not offer much in terms of details in regards to the design of the eyepiece and it's lenses. However the do mention that these have a "Flat field vision", which is ambiguous, but I think that it means that they use field flattener lenses in the eyepieces to flatten the image and ensure that it remains in focus right to the edges. If this is the case, then that is great news. Other than that all I can report is that the outer ocular lenses have a 22mm diameter which is quite typical. Whilst we are not given the exact makeup of the objectives and all their elements, I can confirm that they have at least one extra-low dispersion (ED) glass element within them. In a skillfully designed optical system these ED glass elements enable more manipulation of the individual wavelengths and so can reduce chromatic aberrations more than standard low dispersion glass and thus potentially deliver an image that displays less color fringing around the edges of the view. By and large, the shape of the bin gives us a big clue, there is no surprise to find out that the Opticron DBA VHD series uses roof prisms within them to correct the 'upside down' image. Opticron have also confirmed to me that they have used BaK-4 glass to make them, which is good news. 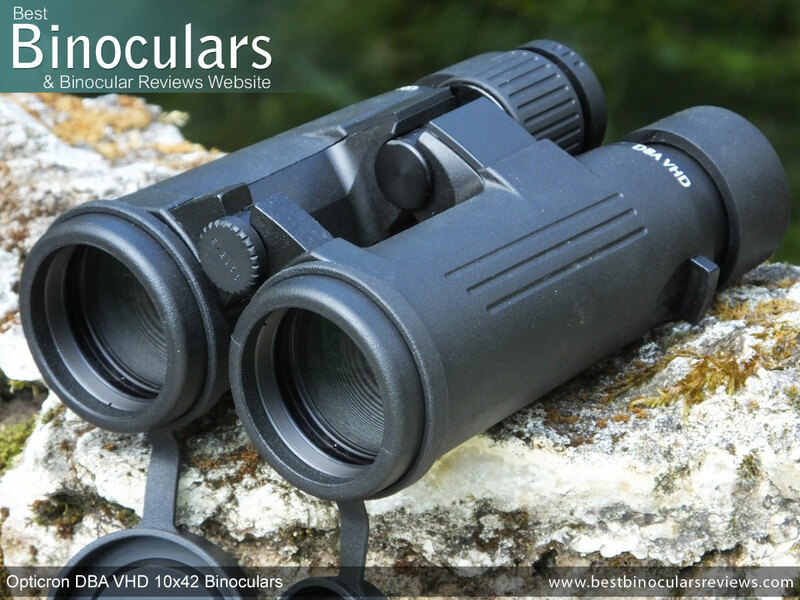 It should be no surprise at this level of quality to revel to you that the 10x42 Opticron DBA VHD binocular is Fully Multi-Coated, meaning all air to glass surfaces throughout the system have multiple coatings of an anti-reflection material added to them. The result is that less than 1% of light gets reflected away or in an unwanted direction compared to between 4% and 6% on untreated systems and so they will display an image that is markedly brighter and of a better quality. In order to improve the transmittance of light of the roof prism manufacturers will sometimes add a highly reflective mirror coating to it. The cheapest option is an aluminum mirror that raises it to around 93%. Better still, but more expensive are silver coatings that can get the transmittance levels to between 95% and 98%. 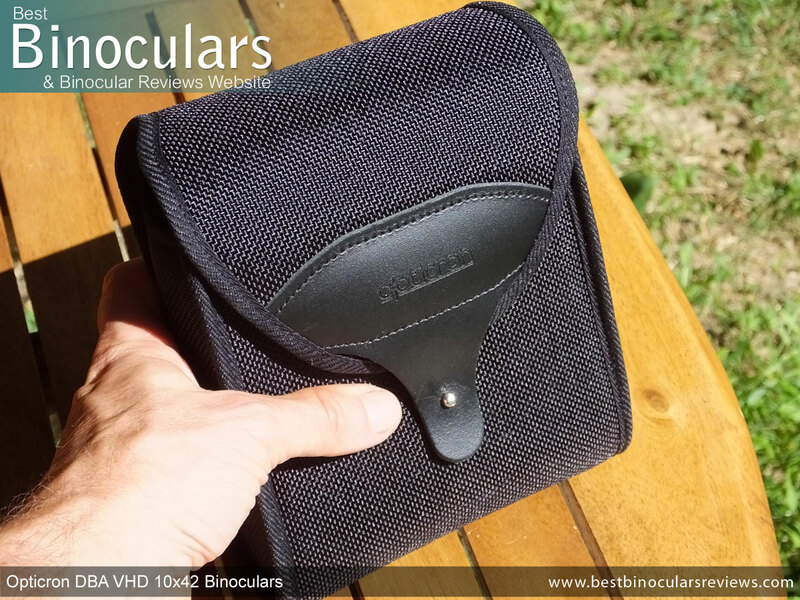 However some high end bins, including these Opticron DBA VHD binoculars go even further using dielectric coatings that are said to raise the reflectance to more than 99% of the incident light. Opticron's own version of these prism coatings is known as "Oasis", which comprises 64 separate layers and which they confirm has a reflectivity of more than 99%. I can also confirm that the prisms have been phase corrected, eliminating the "phase shift" phenomenon and so they produce a higher image resolution and better contrast than untreated prisms. 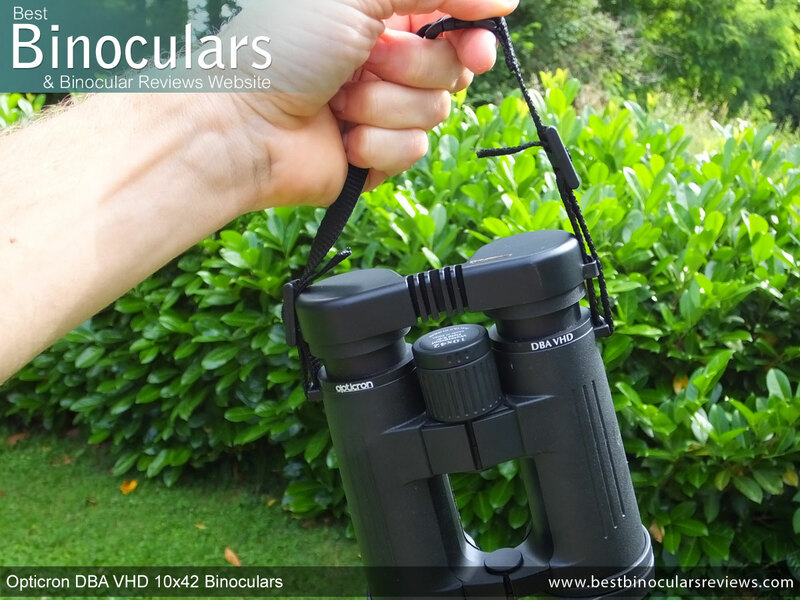 This Opticron DBA VHD 10x42 binocular has an advertised FOV of 315ft @ 1000 yards (105m @ 1000m), which basically means that at a distance of 1000 yards away, the view you see is about 315 feet wide (or high). On BBR we rate a close focus distance of 6ft or less as being excellent for a binocular of this size, so with an advertised near focus distance of 8.2ft (2.5m), I would consider these as being 'good' for the occasional close distance use, but not an ideal choice if your main passion is viewing insects, flowers or anything else from really close distances. Note, to check I tested my sample by measuring the closest distance that I could focus on something and it came out as being exactly the same distance as advertised. 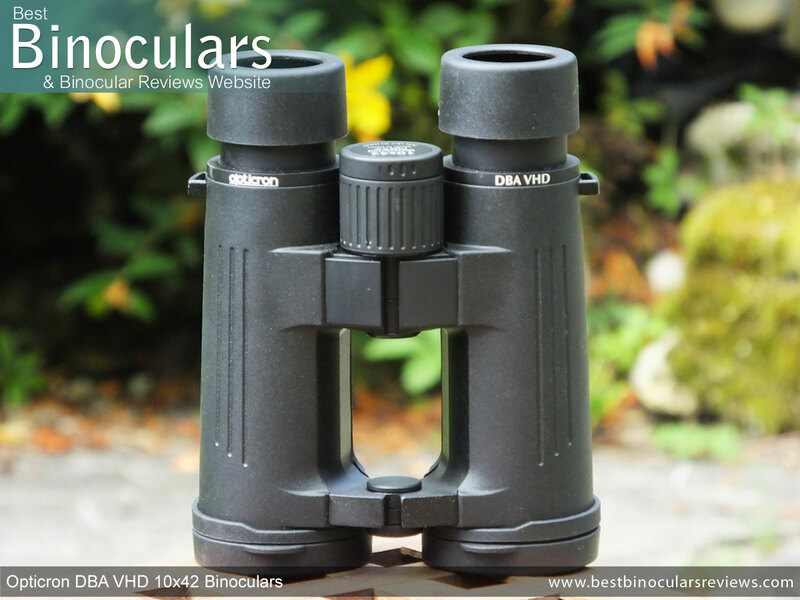 The 17mm of eye relief that you get with the 10x42 Opticron DBA VHD binoculars is very good but just falls short of being classed as having Long Eye-Relief here on BBR by 1mm! However this amount should still easily allow almost all wearers of eyeglasses to see the full field of view by twisting down the cups. I had no issues at all with either the colors or contrast when looking through these Opticron binoculars as the view is vibrant but not unnatural looking and I could not detect any undesired tinting that you can sometimes observe. To test the brightness and low light performance, I carefully compared the views between my controls and these in what I would describe as normal light during the day and then again in low and very low light in the late afternoon/early evening. In the normal daytime light, the brightness of the views that I saw through the Opticron DBA VHD 10x42 Binoculars and that of my controls looked to be equal. This is to be expected your eyes are being supplied with more than enough light to make a good image and only a really poor optical system using substandard materials would be really bad under these circumstances. It was at the end of the day where I was able to detect a very slight difference between the two and I do feel this is where the better quality glass and their coatings make a difference with the Opticron outperforming my control bin. Therefore I can rank these as having a very good low light performance for a 10x42 configuration. Keep in mind however, if you want to have a bin that performs even better in very low light (this will include for use in dense forests for example) then you will be better off with the larger exit pupil that you get with the 8x42 version. I can confirm that the VHD optical system that includes ED glass does a good job as the amount of color fringing that I could observe under extreme circumstances was very minimal and about as good as it gets for a bin with a 10x magnification. The view to my eyes was also nice and flat from the center almost right to the edges, meaning that it remained in focus and I never noticed any distortions. The levels of softening right at the edge of the view were also extremely low, ranking them amongst the better views in this high end class. At the time of writing this review, the Opticron DBA VHD binoculars had only just been released and as such my sample was shipped with a case that is designed for the less expensive Countryman BGA HD as Opticron were still awaiting delivery of the DBA VHD case. I also like the simple way in which the flip over lid is held closed. Sure it is not as secure as a Zip, but it is secure enough and does not make any noise when you fasten or unfasten it, unlike Zips or Velcro, which if you are not careful with can alert or even frighten certain wildlife of birds. The bins have a good fit inside the case, with not so much room that they fall about, but enough so that they are simple enough to take out and replace. I also like it that you can close and fasten the lid with the eye-cups extended and the lens covers in place, which is an annoying oversight that I often come across. Weak points: Whilst not the thinnest out there, the padding is a little lightweight for my liking and as such offers not as much impact protection as more thickly padded cases. The fact that the case does not come with it's own strap, I think is a good thing as it makes the case more lightweight and less cluttered and you simply use the neck strap of the bins and thread them out through the sides of the case. However I do feel that they should have added a loop on the rear of it so that you have another option of carrying it on your belt. There are no separate pockets on the case, either internally or externally. Not a major issue, but for some they can very useful. 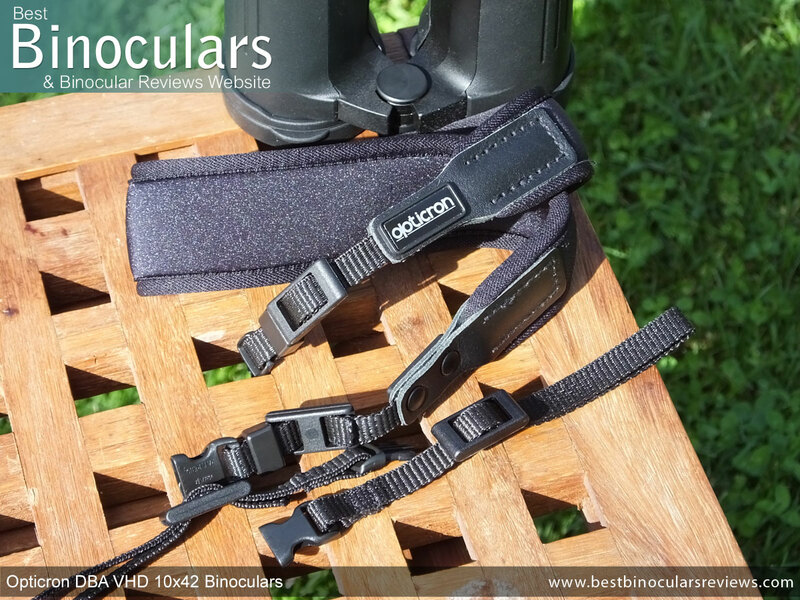 I love the included Opticron neck strap, which is by far the best included accessory and easily amongst the better ones out there. The neck and shoulder section is slightly curved so as to fit better without crumpling and the soft Neoprene padding is both wide (4cm) to spread the load and thick (5mm). I also like that the underside is not covered in material and so this grippy surface helps to stop the strap from sliding about around your neck and shoulders. The thin nylon part of the neck strap fixes to the binocular via the two eyelets on the sides of the instrument and then back through a slider so that the length can be adjusted. But the real pi�ce de r�sistance are the quick release clips on this part of the strap that allow you to swiftly remove the main part of strap from the binos. The short sections can then be joined together and 'Ta-dah' you now have a short hand strap! Brilliant. 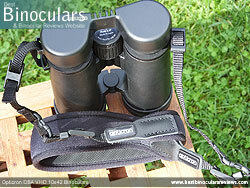 The Opticron stamped rain-guard that comes included is good. Made from a soft plastic, it has a bridge that is specially designed to be flexible so that it can be replaced no matter what setting you have positioned your inter-pupillary distance at. (This is a very minor point, but incredibly is something that does sometimes get overlooked). The fit of the actual cups that go over the eyepieces is also good, unlike many that just come away far to easily, so this is also nice to see. I like it that the rubber used on the objective lens covers are a little thicker and thus feel a little tougher than most others that I come across. I also like that they hang under the bin when in use and they also fit onto the barrels nice and securely and thus have less chance of falling away inadvertently that could lead to your lenses getting damaged. Indeed the only real area where I feel they cold be improved is in their aesthetics. Lens covers that fit into the ends of the barrels and not over them like these just look that more cleaner and more a part of the instrument as a whole, rather than just being an afterthought. Whilst this is a very minor point, I feel in the high end category that these Opticron's are in, it is the small things that can sometimes be the only real difference between two on your shortlist. My sample did not come suppled with a cleaning cloth, however at the time of writing, these bins had only just been released and so I am not sure if this was simply an oversight, or if all will be supplied without. 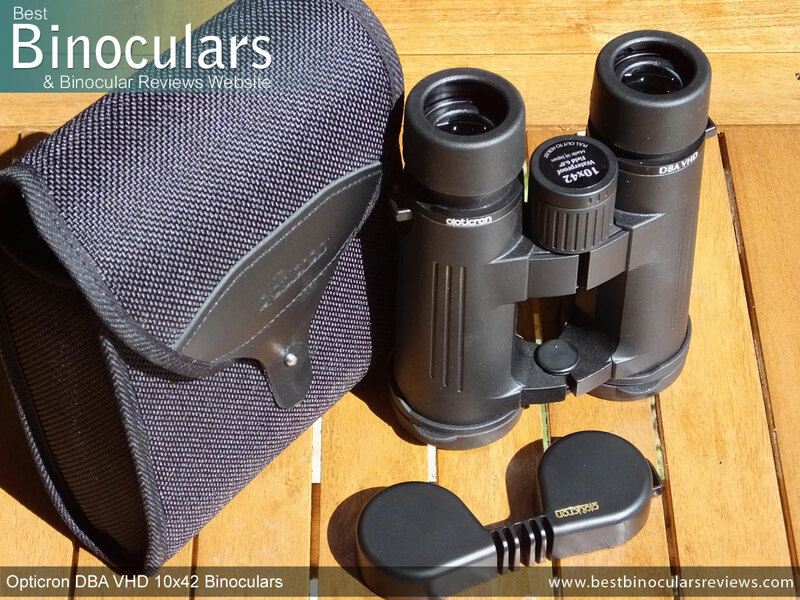 Whatever the case, I will still suggest that you get a good Lens Cleaning Kit, especially for bins of this quality so as to ensure that you maintain the quality of the view without risk of marking the lenses when cleaning. 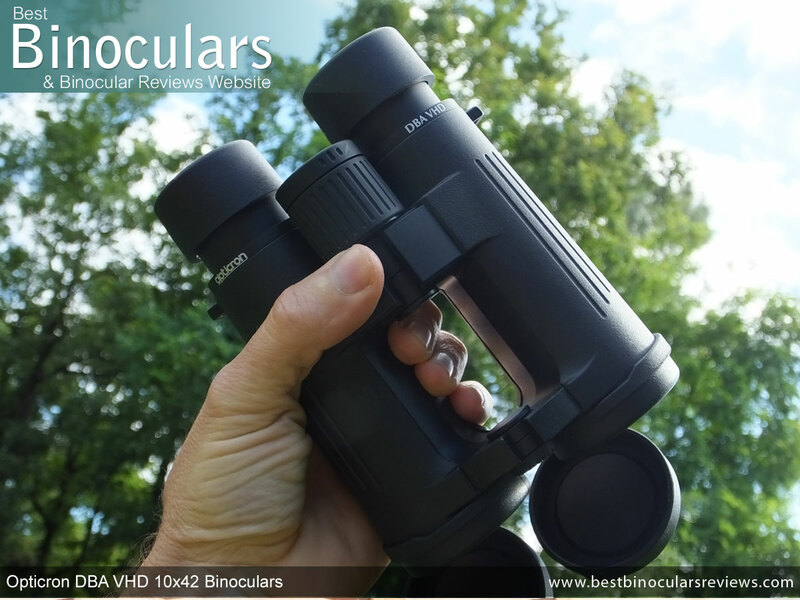 The Opticron DBA VHD 10x42 binocular comes with Opticron's Limited Lifetime Warranty on new instruments purchased from authorized dealers in North America and a 30 year guarantee for those purchased in Europe. No manual was included with my sample, once again I believe that this is only because of how new they were when I tested them. 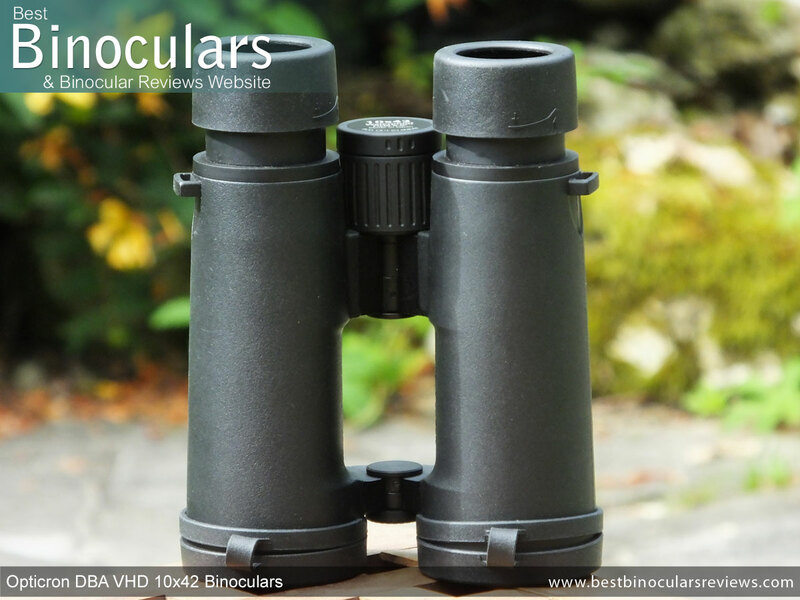 Broadly speaking, I feel that there can be no argument as to the quality of the materials and components used on the Opticron DBA VHD 10x42 binoculars. Thankfully the sum of all the parts also add up and I believe directly results in an instrument that not only looks and feels the business, but delivers to you a very high quality view that even the most critical users will appreciate. Whilst neither are a major strength, for a 10x42 they have a good field of view and plenty of eye-relief. Small but sometimes important details like the lockable diopter incorporated into the focus wheel and metallic eye-piece housings are nice touches and is what separates these from many of their direct competitors. This also most certainly includes the excellent neck strap that I really liked. With it's quick release clips it can be very quickly converted to a hand strap, a small but nice touch. Weaknesses: The minimum close focus distance is a little longer than on some 10x42's, but to be fair it is also nowhere near a major weakness either. Whilst as I have said that I especially like the diopter being incorporated into the focus wheel, the fact that the rear face of the wheel remains static can take a little getting used to - True it is a very minor point, but I feel is worth pointing out. Again this is not a major weakness, but I did feel that unlike the excellent and innovative neck strap, the other accessories just do not do the actual instrument any justice. Whilst it is probably true to say they all function more than well enough and indeed they are on a par with most at the mid to high end level, I just feel that they fall a little short of the very best in terms of quality or perhaps luxuriousness. Thanks for taking the time to read my Opticron DBA VHD 10x42 review, but just to finish off, I would like to stress that unlike a lot of so called "reviews" you will most have certainly come across on the web, this one as indeed all others on BBR is my truthful and honest opinion of the product which I only finalized after completely researching, testing and using them. Sure I do make mistakes, be that in my researching of the product, writing the review or when making certain assumptions, so if you do spot any, please feel free to point any out so that they can be corrected.